Tiffany Nguyen wasn't always an outdoors fanatic. The Californian admits that growing up, hiking and camping wasn't always on her radar. But thanks to an impromptu trip to the iconic Yellowstone National Park, her whole perspective on the natural world changed. Since that day, Nguyen has made it her mission to hit the open road in search for an adventure as often as she can. 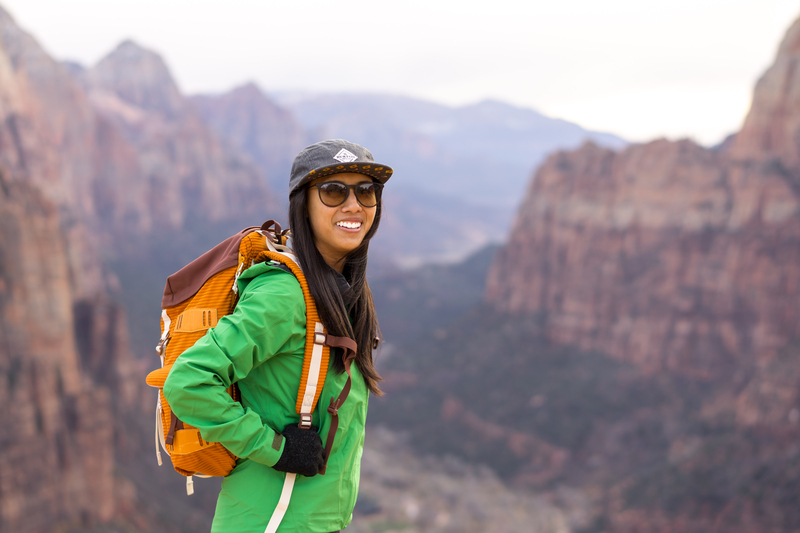 Nguyen has camped and visited scenic landscapes all across the United States, including The Grand Canyon, Temple Crag, and Zion National Park. She's also an expert at this point on the Canadian Rockies. What makes her travels even more incredible is the fact that she documents her favorite hidden outdoor gems on Instagram so that everyone can follow suit and plan their own excursions. Her absolutely stunning account has garnered over 140,000 followers and shows no signs of slowing down. And it's no surprise; one look at the vibrant landscapes and you'll have a serious case of #wanderlust too. And Nguyen does all of this while maintaining a 9-to-5 job as a dentist -- yes you read that right. She's proof that you can have a traditional job during the week and travel to remote places during the weekend, so long as your prioritize your passions. We had the chance to speak to Tiffany Nguyen about why Yosemite changed her perspective, how Instagram has changed the way she travels, and the one place she's most exited to visit. And if you want even more Tiffany Nguyen news, head over to AOL.com at 12 p.m. ET to see more exclusive features, including her newest gig as a Burton Brand Ambassador. Did you always grow up with a love for photography and camping? So photography is actually a pretty new hobby for me. I got my first camera maybe two years ago. And growing up as well I didn't really do much traveling since I was in school getting my bachelor's and then I went straight into dental school, so there wasn't a long period of time I could travel. It was just short trips here and there. But two years ago I went Yosemite for the first time and that was a really big turning point for me. I was always taking pictures on my iPhone but ever since then, I took my camera everywhere with me. Ever since then, it has been really important to me to document all of my experiences. Was camping something you were ever involved in beforehand? No, not at all. Growing up, my family wasn't into the outdoors at all. We would get a hotel or be by the beach for our vacations. So the outdoor camping and hiking is all super new to me too. What catalyzed your trip to Yosemite? I knew people going through the National Parks and I thought I would go to one that wasn't far from here. And Yosemite is about six and half hours from me and it was a place where people always seem to Instagram. I saw a picture of Half Dome, which is in Yosemite, and I thought to myself, "I have to see this place!" I just decided to go camping there and that was the start to everything. How have you seen Instagram change the way you travel? I would definitely say that Instagram is one of the first places I go to find inspiration for my next trip of adventure. There are just so many different hidden gems and places to explore, and Instagram makes it so much easier to find these places. Especially when photographers post pictures from places it's a cool moment to look at them and think, "Wow I've never seen this place before." And people are so nice and open about where the locations are so it's easier to find inspiration. Where's one place that you found on Instagram that is now on your list of places to go? There's this place in British Columbia called The Great Bear Rainforest. It has these white grizzly bears that come out in the summertime and they're out catching salmon and just hanging around in the rainforest. They look incredible so I definitely want to go there sometime. I think there's a misconception that Internet culture keeps people stationary, but it's cool to see that it's helping people travel and disconnect. So true! There are so many people are inspired by what they see online these days and when they see those photos, they think "I could be out doing this too!" YouShouldKnow is a feature that showcases up-and-coming social stars. To see more of past interviews, click here. And come back at 12 pm EST for more exclusives on Tiffany Nguyen, including her newest gig as a Burton Brand Ambassador.